Time of realization: February 28 - March 1, 2012. The organizer: Mir-Expo Exhibition Company, Ltd., Union of Composite Manufactures. February 28 - March 1, 2012 at IEC Crocus Expo there were held 5th edition of Composite-Expo - 2012 exhibition - a leading international specialized event in composite industry in Russia, where full range of manufactures of raw materials, equipment and finished products of composites is widely introduced. In comparison with the last year display area increased by more than 50 percents. Over 70 exhibitors took part in the show from 18 countries (Russia, Belarus Republic, Ukraine, Lithuania, USA, Austria, France, Germany, Italy, Hungary, Macedonia, United Kingdom, Luxemburg, China, Turkey, Finland, Netherlands, and Brazil). In the show Among the exhibitors were the following companies: Akzo Nobel N.V., Bang & Bonsomer, Mikrosam AD, Bautex LLC, Prepreg-SKM JSC, Polotsk-Steklovolokno JSC, P-D Tatneft-Alabuga Fiberglass LLC, Evonik Industries AG, STEKLONiT Management, IGC-Composite LLC, Novgorodskiy Fiberglass Plant, OCV Steklovolokno JSC, Union of Composites Manufacturers, INTERVESP Corporation, Izhevsk Elektromekhanicheskiy Zavod KUPOL JSC, Intrey - Chemical products LLC, Composite group, KTI Union, STEVIK SAS, Lavesan Srl, Nord Composites, GFM GmbH, AKPA Organic Peroxides, Accelerators & Paint Driers and others. At the Composite-Expo - 2012 there presented the following brand new materials and products: Airtech Sarl showed the latest product development - the Airseal sealant tape range. The range can now cover the market needs in the higher temperature range of sealant tapes up to 150°C and be definitively competitive at the same time. Novgorod Glass Fiber Plant exhibited basalt superthin and ultrathin fibres, glass staple fiber from 100 nanometres, hollow glass microspheres from 150 nanometers. ASD - Tehnika presented dosing robots and automatic lines for applying by GASKETING (FIPG, FIPFG) and SEALING (CIPG) technology with use of modern sealing materials on the basis of silicone and polyurethane materials on basis of foamed and compact polymers. New Carbon Fiber Materials LLC demonstrated a new type of composite armature. February 28, 2012 within the business program of the Composite-Expo - 2012 exhibition there were held the Current State and Prospects of Development of Production and Use of Composite Materials in Russia, 5th Practical-Research Conference, organized by Union of Composites Manufacturers and Mir-Expo Exhibition Company LLC. During the conference there discussed the matters regarding composite materials manufacturing and use, and main problems of Russian composite market development and the ways of their possible solutions. At the conference the specialist of the many Russian and foreign companies took part. They are as follows: Dow Europe, BYK Chemie GmbH, Ashland, Holding Company Composite, Polet NPP, LLC, Delkam-Ural, Special Economic Zones JSC in the Ulyanovsk Region, Techno Express CJSC, ZAO EPITAL, Syrgis Performance Initiators and Sampol LLC. February 29, 2012 within the business program of the exhibition there were held the presentation of Bang & Bonsomer Company which contained the presentations of the following companies: Composite Integration - a developer and manufacturer of advanced injection equipment and components for production system; Richmond Aerovac - one of the world leading suppliers of expendable materials for vacuuming in the field of special composites; Marbocote - a manufacturer of high technology semipermanent release agents for all production technologies of composite parts; Formax - one of the world leading manufacturer of reinforcing fabrics for composites, the company produces multi coaxial carbon fabrics and high technology fabrics of glass and aramide fibres. Also February 29, 2012 the Conference called "Composite materials: modern technologies, equipment and development aspects" was held with the support of Mir-Expo Exhibition Company and Union of Composites Manufacturers. At the conference the specialist of the following companies presented their presentations: Techno-Express, Mikrosam A.D., Ingersoll and Terruzzi. 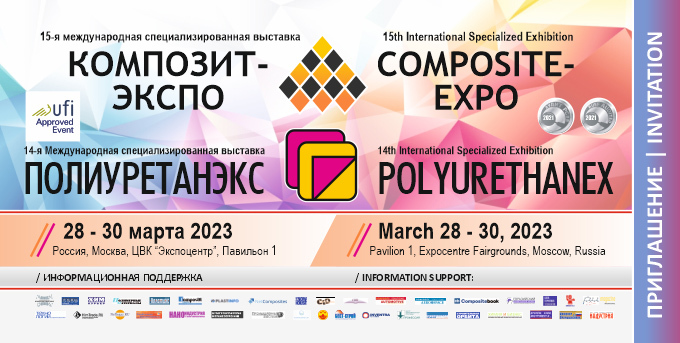 At the same time with Composite-Expo, the International Specialized Exhibition POLYURETHANEX ran for the third time and allowed a wide range of specialists to get acquainted with innovation technologies of manufacturing and samples of finished products of polyurethane materials for different branches of industry. Over 30 exhibitors took part in the show from 9 countries (Russia, Ukraine, USA, Germany, Italy, Sweden, United Kingdom, China, Netherlands). 4th International Practical-Research Seminar called - the Current State and Prospects of Development of Production and Use of Polyurethane Materials in Russia - was held within the business program of the exhibition. Independent audit check of statistic figures were fulfilled for the first time during Composite-Expo and Polyurethanex exhibitions. According to the experts on the space of 3300 sq. m. there situated 103 exhibitors, including 54 national (domestic) companies and 49 foreign ones from 19 countries. Over 4800 people visited the shows and 97% of them were specialists in different fields of industry. It is evidence of the growing demands of the Russian market to use modern innovation materials and technologies in different industries. The majority of the exponents showed the intention to take part in the 6th International Specialized Exhibition Composite-Expo - 2013 next year. It's planned to be held in February 26 - 28, 2013 in Crocus-Expo, Moscow. 4th International Practical-Research Conference Modern State and Prospects of Development of Production and Use of Composite Materials in Russia. The annual exhibition Composite-Expo is one of not many platforms where market participants can exchange new ideas and share their best practice with partners in sphere of composite materials development in Russia and CIS. On behalf of Owens Corning I'd like to wish you a dynamic development and exhibitors' number growth year in year out, Thanks! This Composite Expo is a success. We have known that Russia has a huge and potential market in composite industry. Many investors would like to invest in Russia and cooperate with Russian company. We also hope more foreign countries can participate in this exhibition. We hope Russian Composite Expo can enlarge popularity and influence in the world. Kuzmina, Exhibitions & Promotion Manager, Akzo Nobel N.V., Representative Office). In my opinion the exhibition Composite Expo triggers more and more interest in professional area and attracted a particular attention from Medias this year. We noted as well a substantial growth of number of visitors from year to year. We are quite content about the results of this exhibition and will certainly participate next year. It was the first time IGC Composite participated in Composite-Expo. Representatives of different companies visited our booth, negotiations with our key customers was carried on during the exhibition. This event gave us a possibility to present the new products of Scott Bader Company, meet new people working in the branch of composite materials as well as our regular customers. We've obtained more than 20 potential partners and began working at new interesting projects. We would like to thank managers of the exhibition for professional and successful work".